This past Sunday, I joined C-SPAN’s Washington Journal for a discussion on the House GOP poverty plan released earlier in the week. My conservative counterpart on the show—Robert Rector of the right-wing Heritage Foundation—made his views on poverty clear early on in the conversation when he lamented that our aid programs are “too generous.” Believe it or not, he went on, poor people in America have basic household appliances such as refrigerators, stoves, ovens, microwaves, and—gasp! —air conditioning. He accused folks on the left—and the nonpartisan Census Bureau—of “exaggerating” the state of poverty in the United States. All joking aside, the fact that Rector is still peddling this line reflects just how out of touch right-wing views on poverty are today. For starters, are our aid programs “too generous”? As I noted on Washington Journal, Rector should try telling that to the more than 6 million Americans whose only income is food stamps—which provides just $1.40 per person per meal in nutrition assistance. Or the three in four low-income families who are eligible for housing assistance but don’t receive it and can spend 60, 70, or 80 percent of their income on rent and utilities each month, while they remain on decades-long waiting lists for aid. Rector should see how his line goes over with the three in four families with children in poverty who are not helped by Temporary Assistance for Needy Families (TANF), because it was converted to a flat-funded block grant that’s lost one-third of its purchasing power since 1996. Or even with the small fraction of families lucky enough to receive TANF—because in no state are benefits greater than half the federal poverty line. And are poor people in America secretly living high on the hog? Most observers view the austere federal poverty line as an inadequate measure of hardship. Experts say a family of four needs an annual income of $50,000 to achieve an adequate but basic standard of living—more than twice the poverty line for a family of four, which is a measly $24,000. By that measure, the number of people in this country struggling to make ends meet far exceeds the 47 million Americans with incomes below the poverty line; it amounts to nearly one in three Americans—more than 105 million people—living on the economic brink today. This much larger figure is confirmed by recent survey data. In a report released last month by the Federal Reserve Board, one-third of American adults say that they struggle to make ends meet. It is clear that after decades of growing income inequality, economic hardship can hardly be described as an “us and them” phenomenon. With working families facing flat and declining wages and gains from economic growth increasingly concentrated in the hands of the wealthy, economic instability is now a widespread experience. Rector’s comments on Washington Journal made clear his proposed solution: Just deny the existence of poverty and hardship in America. If poor families are actually doing just fine—they have refrigerators and microwaves, after all—then not only does that free up policymakers to slash aid programs, it also removes any need to boost wages or enact any other policies that would cut poverty and make it easier to get ahead. But for the 105 million Americans struggling to get by, the fact that they are fortunate enough to be able to refrigerate—and heat!—their food offers cold comfort. It’s not just Heritage who’s out of touch. Last week, House Speaker Paul Ryan released a long-awaited poverty plan as part of his “A Better Way” House GOP policy agenda. He unveiled the plan at a drug rehab center, offering a not-so-subtle reminder of his views on the causes of poverty. 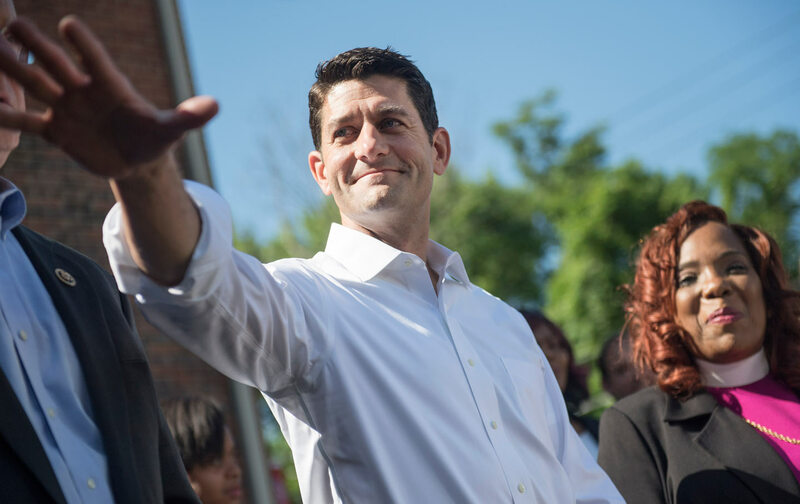 As Congresswoman Gwen Moore (D-WI) pointed out at a Center for American Progress event last week, if Ryan truly understood poverty in America, rather than seeing struggling individuals as “broken people,” he would have given the speech at a McDonald’s, surrounded by low-wage workers struggling because of a broken economy. In addition to slashing housing assistance in the midst of a national affordable-housing crisis, and proposing to cut school lunches, their solutions to poverty include legalizing bad financial advice by rolling back the Obama administration’s “fiduciary rule” and blocking the Consumer Financial Protection Bureau’s proposed regulation to protect cash-strapped borrowers from predatory payday lenders. Perhaps even more notable than what’s in the plan is what it leaves out: any policies to create jobs or boost wages. Indeed, Ryan made clear in the Q&A following his speech that, despite his previous claims to want to “push wages up,” he and his colleagues remain steadfastly opposed to raising the minimum wage. Bipartisan interest in tackling poverty and expanding opportunity would be a welcome development. But instead of putting our heads in the sand, policymakers on both sides of the aisle must acknowledge the very real experience of poverty in America—and the many structural barriers that stand in the way of getting ahead. That starts by admitting that poverty exists. Rebecca VallasTwitterRebecca Vallas is the director of policy of the poverty to prosperity program at the Center for American Progress and the coauthor of the report “One Strike and You’re Out: How We Can Remove Barriers to Economic Security and Mobility for People with Criminal Records."